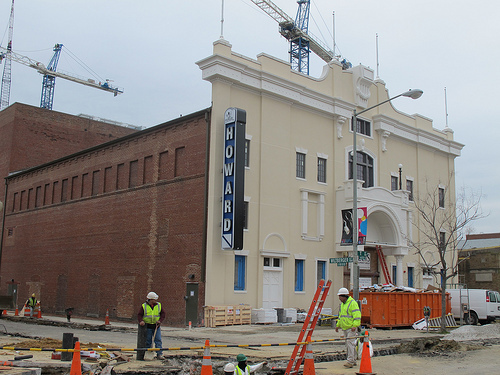 PoPville » Dear PoPville – Are Ticket Prices Too Expensive for the new Howard Theatre? Dear PoPville – Are Ticket Prices Too Expensive for the new Howard Theatre? Some friends and I were discussing going to see Wanda Sykes in April at the new Howard Theater. Then I got online today to get tickets and noticed that the cheapest were $95 plus $12 in fees. Needless to say, I didn’t get tickets. Seriously?!?!? Over $100 for a ticket to see a comedian!!! My question is: are people willing to pay those prices for an event at the new Howard Theater? Hoping that all their shows are not that expensive. You can get Wale tickets for $35. You can find the full calender of upcoming shows here. As for comedians – Jerry Seinfeld tickets are going for $89 + $15 in fees for an upcoming show in Los Angeles. Do you guys think $95 is too expensive for the cheapest seats to see Wanda Sykes at the new Howard Theatre?